Earlier this year, Watershed the British Council chose two UK creatives from an open call for the Playable City Tokyo Residency 2018. The residency was an opportunity to collaboratively research and develop playful ideas at the intersection of art, technology, society that innovate around public space in Tokyo. Bristol-based designer Tom Metcalfe and London play scholar, Sophie Sampson were selected to complete a two-stage residency in June and September. Playable City Tokyo launched in 2015 to develop imaginative new ideas for urban spaces and to engage communities in thinking about the future of Tokyo (particularly in the run-up to the 2020 Olympic Games). Phase One of the programme was a research visit to Tokyo in June. This was an opportunity to meet local creatives, explore, research and ideate around experiences for public space in central Tokyo. Phase Two was a prototyping visit to Tokyo in September to test and share pieces for the attendees of the Making the City Playable Conference 2018. The making of the prototypes was supported by time at the PM Studio to think through interactive elements with David Haylock, our lead creative technologist. Sophie and Tom brought a really interesting mix of experience and curiosity to the growing Playable City Tokyo programme. Of particular interest to me as Playable City Producer, was witnessing how their very diverse approaches stimulated one another to think differently about their work over the two visits. Sophie ‘came to Tokyo curious about what the rules are about playing in public, and how people are framing spaces as ones where it is safe and acceptable to play. She‘ found the city crammed full of playful design and people engaging in many different types of playful behaviours.’ (you can read her full blog here). 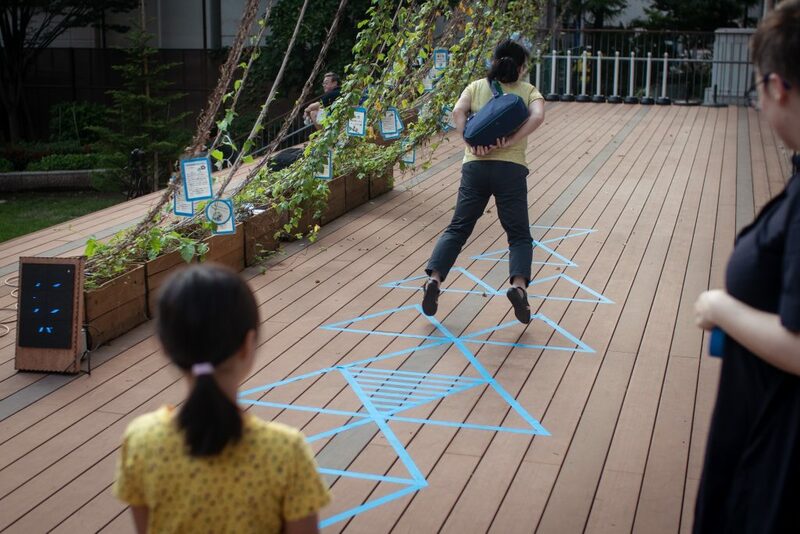 During the research trip, she carefully created and improvised with pop-up play spaces for an afternoon, simply marking out a modified ken-ken-pa board (a Japanese analogue of hopscotch) in coloured tape on pavements and walkways. Despite a punishing bout of heavy rain that lasted most of the week we were there, Sophie managed to run a few outdoor playful sessions in the streets near Chiyoda Arts Centre. Between visits, she interviewed a number of academics, playmakers and designers about their approach to play and has created a zine which will be released over the next few weeks. Tom’s work was conceptually engaged with the idea of the playful interface between technology and tradition and the Japanese concept of Wa. 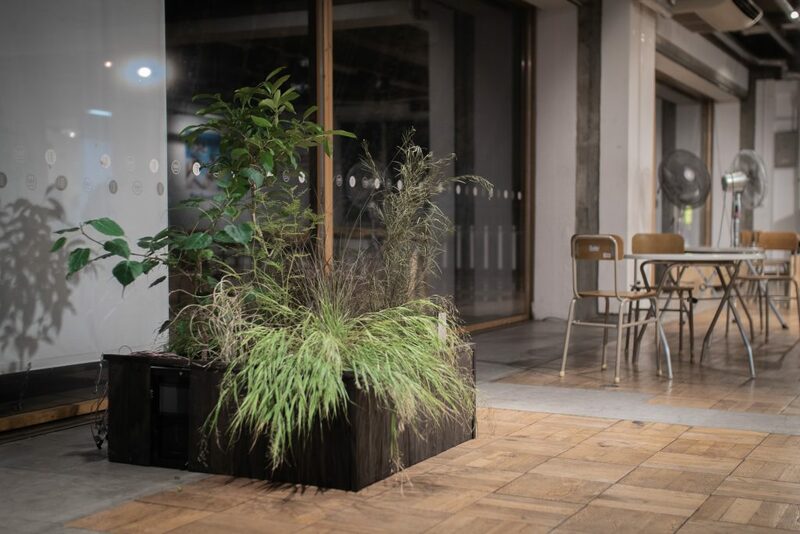 Tom worked with David Haylock to create an indoor plant installation which at first glance appeared relatively standard but had been fitted with robotic bases which imitated wind blowing through the plants. Tom is fascinated by the experiential design of Japanese public gardens and how they integrate into daily life in Tokyo. Both Tom and Sophie are planning o develop their work in Tokyo in 2019, questioning of the concept and practice of play in Japanese life and public space. Sign up to the Playable City Mailing list below for updates on their projects, and new opportunities. The Playable City Residency 2018 was produced by Watershed in collaboration with the British Council, with special cooperation from Rhizomatiks and JKD Collective Inc. The Playable City Tokyo Residency 2018 is a Tokyo Tokyo Festival Grant Program and was supported by Arts Council Tokyo, Tokyo Metropolitan Foundation for History and Culture. For further information please get in touch via playablecity@watershed.co.uk.